The question to business owners a few years ago was “Do you have a website?” With the explosion of personal computers, and the advent of smartphones and tablets, internet access is no longer confined to your desk or office. In fact, there are not many places you CANNOT access the internet, and the coming generation feels the need to be connected 24/7. For businesses, simply *having a website* is not enough – you need a web PRESENCE, and a website is only the starting point of interaction with clients and potential customers. Twitter, Facebook, Pinterest, YouTube, Foursquare, Yelp – these are just a few examples of the many social sharing sites that your business can use in conjunction with a website to “get the word out” about your business, events, sales, or other promotions. Some are better suited to one type of business over another; not all will fit your business model. Use the ones that drive more traffic to your site or to your door, and focus on making the most of them. 1. Making your existing site responsive, or mobile-friendly for visitors viewing it on a mobile device like a phone or a tablet. Screen size limits what is seen first, ease of navigation is a big consideration, and links need to be easily accessed by “fat finger” imprecision rather than mouse cursor precision. 2. Consider a web application (separately hosted, promoted and delivered to phones and tablets via Google Play store or Apple store) designed specifically for mobile devices, distinct and separate from a traditional website. Your business website is key, but is only part of the picture. It should serve as a jumping off point for the rest of your web presence! 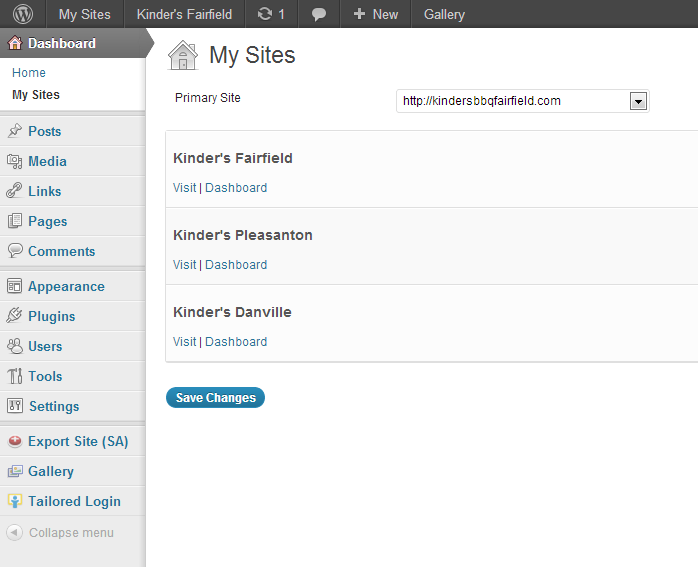 I needed to have one of the three sites as the “main” site, the hosting URL, the base for the other sites. I exported that from my test network as a standalone site, then imported it to the client’s hosting account on GoDaddy all using BUB. Once it was working on it’s own URL as a standalone site, I began the process of making that site the base for the multi-site set up, again, following the codex instructions. The next steps and how well it all works is quite dependent on the hosting provider, and your preference for subdomains or subfolders. I chose to use subdomains, so I had to create the subdomains on the primary URL. Then I had to set up the actual domain URL’s to point to the corresponding subdomain nameservers. It’s easy to get confused, and impatient waiting for the URL’s to resolve and propagate. I tried several configurations, in some cases not waiting long enough for things to resolve before trying something else (thinking it wasn’t working), and had to call GoDaddy to reset some things because I had too many requests in at the same time and nothing was working! Be sure to leave yourself plenty of time (days!) to get this all set up for a client. I then took each of the other two sites, exported from my testing server as a single site using BUB, and imported into the multisite install, again using BackUpBuddy. I can’t say enough about how well BUB worked to move sites! A few link checks and minor changes were all I had to tweak – everything else imported and transferred to the new URL’s so smoothly…worth every penny!! Clients and their requests make this job a challenge every day! A few months ago I was approached by a (potential) client to create 3 websites, related but distinct, each with its own URL. The client also wanted ONE log in to manage all three sites. Thus began my adventure with WP Multi-site. I googled and read much, struggled much, and in the end it is all working, though not without some missteps along the way. I began by setting up a domain as a testing ground for experimenting with multi-site. I installed WordPress in the root (prior to this, I had set up subfolders for each test site, and installed a separate instance of WP in each subfolder). I followed the codex instructions for setting it up as a “network” install. I chose to use sub-domains for the multiple sites, and proceeded to set up my 3 test websites. It all seemed to work pretty well, and may be the way I develop additional client test sites, since it only requires ONE WordPress install, and individual subsites are easily migrated to standalone sites, but I digress…. So, at this point I had three sites, three distinct URLs, with one (super) administrative log in, and I could edit each site individually from that same log in. All 3 sites shared a common theme and plug-ins, making updates simpler. And I could create admin and editor log-ins with access to only one site or to all sites. Once all the test sites were done to the client’s satisfaction, the REAL fun began – migrating (cloning, moving, whatever you want to term it) the whole setup to the client’s hosting, which happens to be GoDaddy. Not the ideal host for this type of setup, but now that I have it working properly on GoDaddy, I think I can get it set up anywhere! The key to making the move (IMHO) is a plug-in from iThemes called BackUpBuddy. It’s not free, but worth every penny for the ease and simplicity of backing up and moving entire sites. There are deals on BackUpBuddy and other Developer tools throughout December. The multi-site version of BUB is in beta, and still has glitches, so I did not attempt to backup and migrate the entire network at once – I did it piece by piece. My next post will detail that process! Design looks easier than it is, and it’s more important than it looks. Good design doesn’t just happen! And while building a website may appear effortless to someone who hasn’t attempted the process, those of us who make it our business know how much goes on behind the scenes. Picasso is in a park when a woman approaches him and asks him to draw a portrait of her. Picasso agrees and quickly sketches her. After handing the sketch to her, she is pleased with the likeness and asks how much she owes him. “No, madam, it took me all my life,” replies Picasso. It may take 5 minutes to do your website update – but it takes years of experience to be able to do it in 5 minutes instead of 5 hours. No one is an expert at everything, although some people seem to have a talent for quickly learning whatever they put their mind to. Sometimes you may have the time and inclination to learn how to repair an appliance, cook up a special meal, or build something. There are other times when you hire a professional to do the same thing in a much shorter time frame, and with enhancements that you wouldn’t (or couldn’t) have added because you don’t have the tools or experience. Whether you hire the pro or do it yourself is a decision only you can make … choose wisely! November came and went, with no birth announcement . . . Jay Austin finally made his appearance on December 9, 2011. He was a healthy 8 pounds, 10 ounces at birth and is over 9 pounds as I write this update. The family is adjusting and we are all enjoying the newest addition. It did make a hectic Christmas season, and I hope to update this again soon, with pictures! Have Fun with QR codes! What are QR codes? I’m sure you’ve seen them on post cards or flyers in the mail, ads on TV, newspaper, or other print advertising, perhaps other places. It’s a small, square, pixelated box similar to the image on the right. What this will do, when scanned with a smartphone app, is send me a text message that says you scanned the code. There’s much more you can do with QR codes. By placing a QR code on your business card, advertising flyer, newspaper ad, or elsewhere, you have provided anyone with a smartphone and a QR reader the ability to instantly connect with you, grab a coupon for your merchandise, read the latest news, see a video about your business, link to your website, even “Like” your Facebook page simply by scanning the code with their smartphone . . . there are many options! Just start looking around you – I’ll bet you’ll see a few of these in some strategic locations. 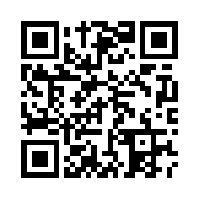 If you have a smartphone (BlackBerry, Android, iPhone) check out the QR Reader apps and start thinking of the possibilities! Has it really been nearly a year since I wrote last? It has, because next week Lily celebrates her first birthday! Actually, it will be the adults around her celebrating for her…but it’s still going to be a party! In November we welcome grandchild #2, a grandson this time. We are all looking forward to this, none more so than my daughter and her husband, I’m sure. How well I remember having two babies just over a year apart, and how tired I was towards the end of the second pregnancy, just wanting to hold the baby in my arms instead of carrying him/her in my body. Updates soon, as my daughter is due right around Thanksgiving time. Time goes by . . .
All too quickly. The past couple of months have been busy, with two new sites launched, and some major updates and activity on another. Living Grace Fellowship Church in Fairfield hired me to redesign their website, and it was launched in early April. We did a total overhaul of the old site and completely redesigned from the ground up. How satisfying to see it “go live”! Moving in a different direction, Shredders Federation launched their online store, selling T-shirts, hats, shoes, and other apparel geared towards Extreme Sports enthusiasts – skateboarders, snowboarders, BMX bikers. Soon to come will be gear and equipment as well. And By Faith Productions is about to host Stand and Be Counted, the premier Christian Music Festival in Solano County, May 21 at Andrews Park in Vacaville. This event has touched thousands of lives over the years, and the weeks before the event see a flurry of activity on the website as the one day event takes shape. So, yes, I’m keeping busy, it’s all good, and I really need to visit this blog more often! !